These two pianists are crowd-pullers in their own right, so pairing them in a virtuoso programme such as this should be an even bigger draw. Arguably, the Norwegian Leif Ove Andsnes, is more of a ‘star’, having recorded a number of prestigious albums for EMI-Warner and Sony Classical. His discography, which ranges from Haydn to Dalbavie, is quite respectable. So, it may come as a surprise to discover that the Canadian, Marc-André Hamelin, has a larger – and more eclectic – worklist. His stand-out recordings include music by Alkan, Janáček/Schumann and Rzewski, not to mention one of his own compositions, the 12 Études in all the minor keys. Trawling through the pages of MusicWeb, it’s hard to find a less-than-complimentary review of Andsnes’ output. Typically, one of his latest albums, devoted to Sibelius, was much praised by Rob Barnett. Alas, this pianist is not well represented on my shelves, but Hamelin most certainly is. Indeed, a new disc/download from him is something of a red-letter day in this household; and that’s why I’ve just added his recent recording of Feldman’s For Bunita Marcus to my pending pile. Well received by Jonathan Woolf, it’s proof, if it were needed, that Hamelin is an artist of considerable range and character. Two of the pieces played here were arranged by one half of the celebrated piano duo, Vronsky and Babin, whose concerts and recordings wowed their fans for decades. These days, lovers of this sub-genre are spoilt for choice. The standard of playing has never been higher, or the spread so wide. Among the fine albums I’ve heard or reviewed in recent years are: Mari and Momo Kodama’s Tchaikovsky; Alessio Bax and Lucille Chung’s Brahms, Piazzolla and Stravinsky; an equally diverse mix of Martinů, Stravinsky, Poulenc and Shostakovich from Sanja and Lidija Bizjak; the third and fourth volumes of the Invencia Duo’s Florent Schmitt series; and more talented twosomes in a double helping of Shostakovich from Toccata Classics. As Stephen Walsh points out in his liner-notes, Stravinsky may have composed and performed on the piano, but he didn’t write much for it. The Three Movements from Petrushka – so memorably played by another Canadian, David Jalbert, on a new release from ATMA Classique – is probably his best-known work for the instrument. The four-hand reduction of The Rite of Spring, which predates the ballet’s infamous premiere in May 1913, is the version played here, on two pianos. And what a remarkable piece it is, its colours superbly rendered from the very start, the tramping rhythms of Dances of the Young Girls as tough and trenchant as one could wish. Even in denser passages the recording is crystal clear, the two instruments sensibly placed in a convincing soundstage. Goodness, this is a piledriving performance, fearless in its noisier moments and unremittingly tense in quieter ones, such as the Spring Rounds. Percussive edges are thrilling, yet never fatiguing, and the interplay between these titans is remarkable for its intuition and unanimity of attack, as their highly focused playing in the Procession of the Oldest and Wisest One so amply demonstrates. That said, it’s the duo’s vice-like grip on the work’s competing rhythms that really impresses. They can be supple, too – just sample the introduction to Part II – and they respond with alacrity to every tic and twitch of this ground-breaking score. The sonorous, system-taxing Teldex recording, engineered by Arne Akselberg, is an added bonus. Just as François-Xavier Roth’s period-instrument Prom and subsequent recording of Stravinsky’s original version of the Rite was a palate-cleanser, so this two-piano version underlines the sheer audacity of this complex and compelling music. And rather than use it as a vehicle for their own virtuosity – which, incidentally, is never in doubt – Hamelin and Andsnes opt instead for a proportionate and thoroughly musical performance. Nevertheless, their combined assault in the Glorification of the Chosen One and the Sacrificial Dance left me gasping for breath. Really, I can’t imagine this piece played with more authority and skill than it is here. Huzzahs all round! Twenty years separate the Rite and the Concerto for two solo pianos. The latter, cast in four distinctly formal movements – Con moto, Notturno: Adagietto, Quattro variazioni and Preludio e fuga – certainly isn’t as secco as some of Stravinsky’s works from this period. It’s the first time I’ve heard the piece, and it enthralled me from start to finish. What a lucid and varied array of rhythms and timbres, and how beautifully these players spring the second movement. The writing is infused with elegance and wit, to which our doughty duo respond with affectionate, often smile-inducing, pianism. The prelude and fugue – concise, clever and so cleanly pointed – is a gem. After that daunting Rite – no sign of flinch or falter there – it’s good to hear these pianists in mellower mode; indeed, there’s a wonderful sense in these short pieces that, although fully engaged, they’re also having a lot of fun. And while the arrangements by other hands lack the panache of the composer’s own, the music is still most enjoyable. As expected, Soulima Stravinsky’s two-piano take on Madrid, originally written for the pianola, is dispatched with rhythmic flair and a sure sense of style. It’s an alluring little number that would make a perfect encore. But wait, there’s more: Babin’s arrangements of the Tango and the Circus Polka, the latter a gentle, rather graceful homage to Barnum & Bailey. True, both sound a little more florid than I imagine Stravinsky would have allowed, had he made them himself, but then the pieces are designed to emphasise the original duo’s individual contributions as much as their collective talents. 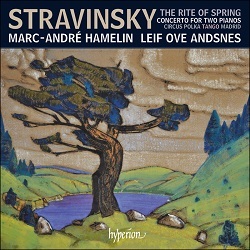 Hamelin and Andsnes finally succumb to unbridled showmanship, and that makes for a hugely entertaining sign-off. As for the studio sound, it’s always full and forensic; indeed, this recording is well up to the high standards we’ve come to expect from Hyperion, whose Andrew Keener is the producer here. Enough energy to launch a Saturn V; a stellar release.